Immigration is not a first class journey but a necessary escape from poverty or war. Looks lost in the void, dead bodies, broken voices. 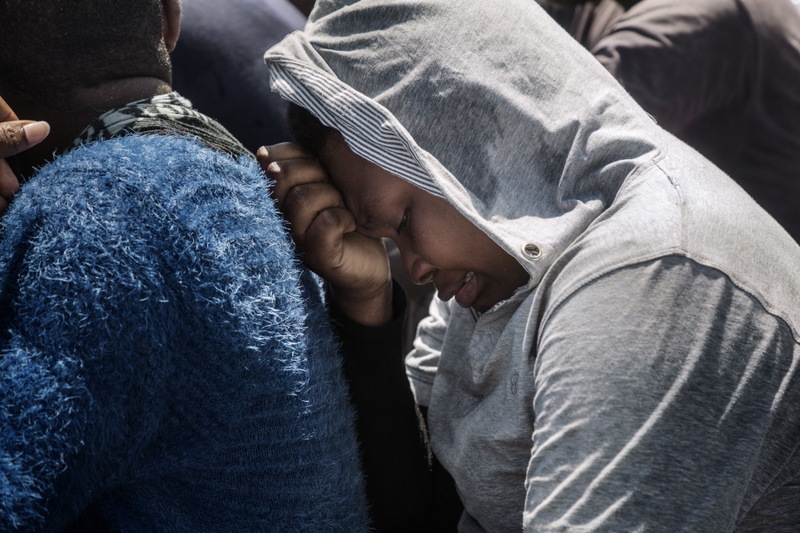 The individual stories of those who decide to sail from the Mediterranean Sea are carved on the faces of 1.250 migrants who in the first weeks of June 2017 were escorted by the Italian Coast Guard crew, in co-operation with the Swedish one, within a European mission. All come from Sub-Saharan Africa (Burkina Faso, Mali, Sierra Leone, Nigeria, Sudan, Congo, Somalia, Ivory Coast), some have been traveling for days, others for months. Some people even took over a year to reach Europe. 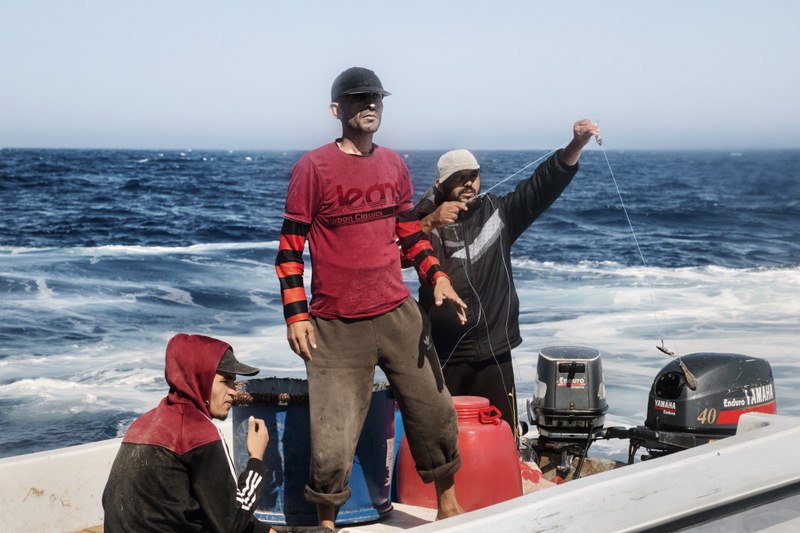 The sightings take place a few miles from the Libyan coasts, then the rescue phase begins, at night, in the dark, or during the day, under the burning sun. 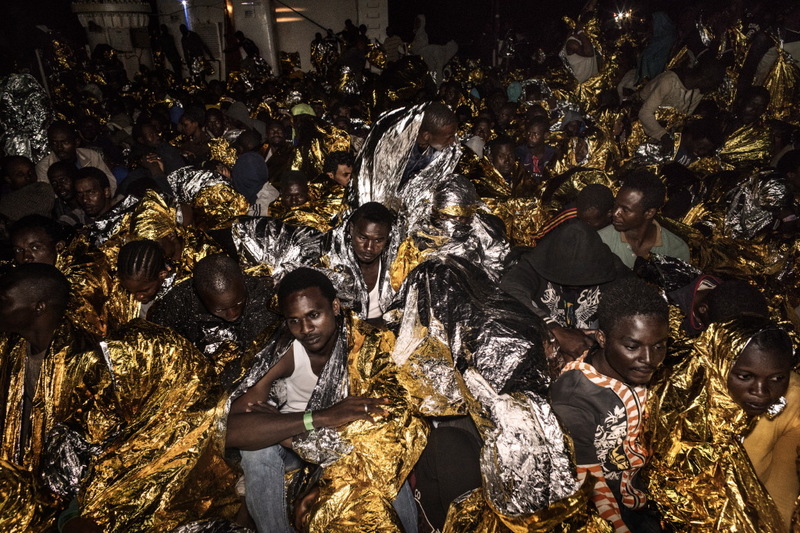 The dinghies are approached, the migrants transported to the “Ubaldo Diciotti” ship and arranged on the aft deck, wrapped in thermal blankets. Operators provide the first medical care, especially to women and children, they distribute water bottles keeping an eye to detect to the most dehydrated first, comforting the most frightened ones. A few meters away there are also small boats with men on board who discreetly observe the rescue operations. They could be traffickers pretending to be fishermen. They are often intercepted and checked. 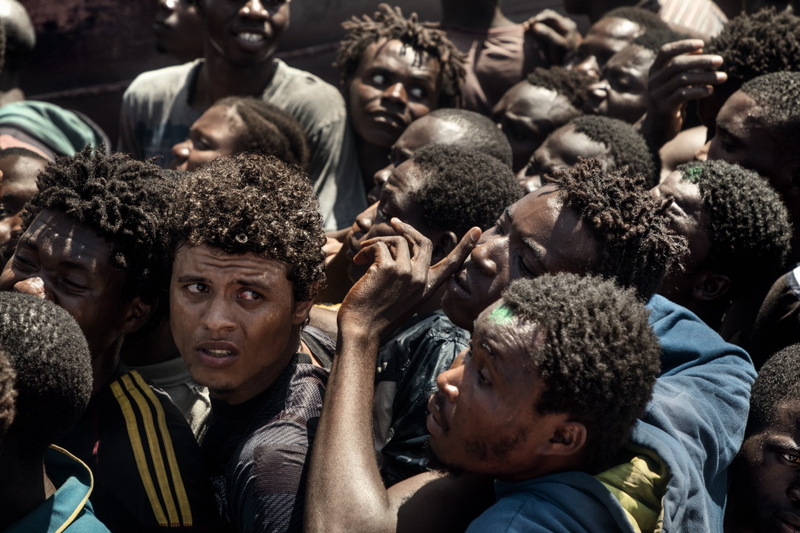 Any information can be useful to stop this global trafficking of men, women and children that has turned the Mediterranean into a real cemetery. 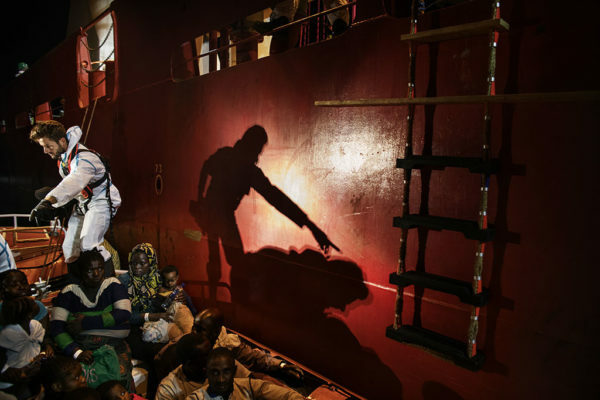 The photos by Luca Catalano Gonzaga were taken in June 2017 on board the “Ubaldo Diciotti” ship and constitute another significant part of the project “Sea gives, sea takes” the narration of the collective epic of migrants and a testify to humanity and humility of the crew of the Italian Coast Guard (text by Sebastiano Caputo). Mediterranean Sea, Italy. 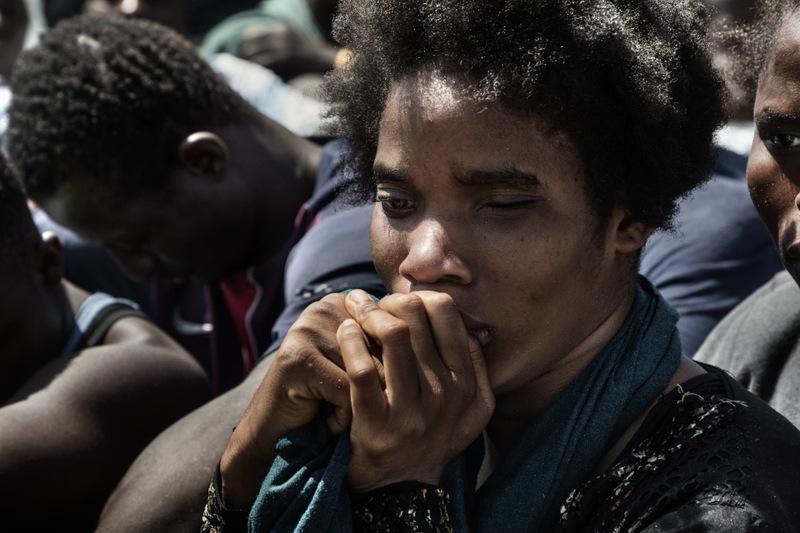 A woman in pain during the delicate phases of rescue. 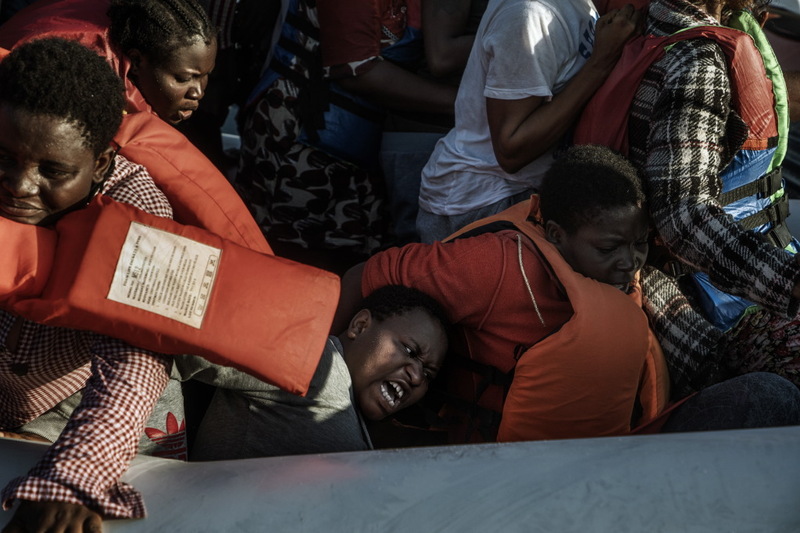 There are so many migrants on each boat, that they often dye from asphyxiation. Mediterranean Sea, Italy. 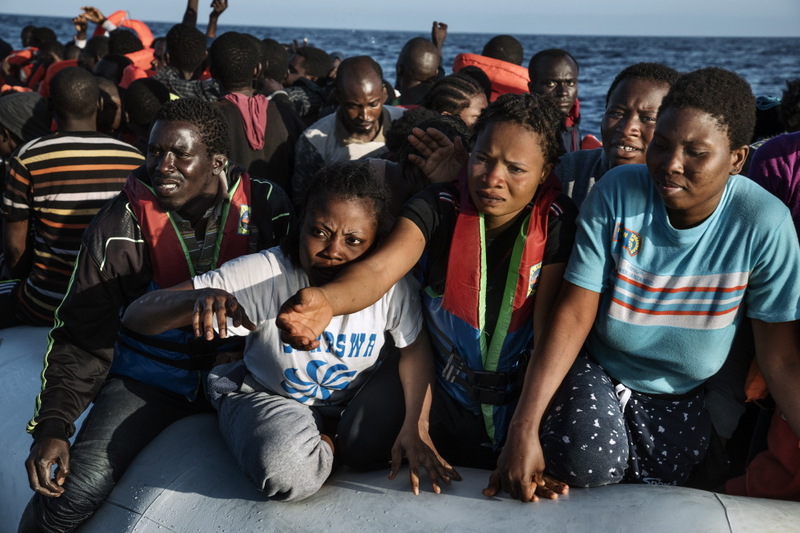 Precius, Sandra and Blessing, all three Nigerians ask to be rescued by the crew of Italian Coast Guard. Mediterranean Sea, Italy. 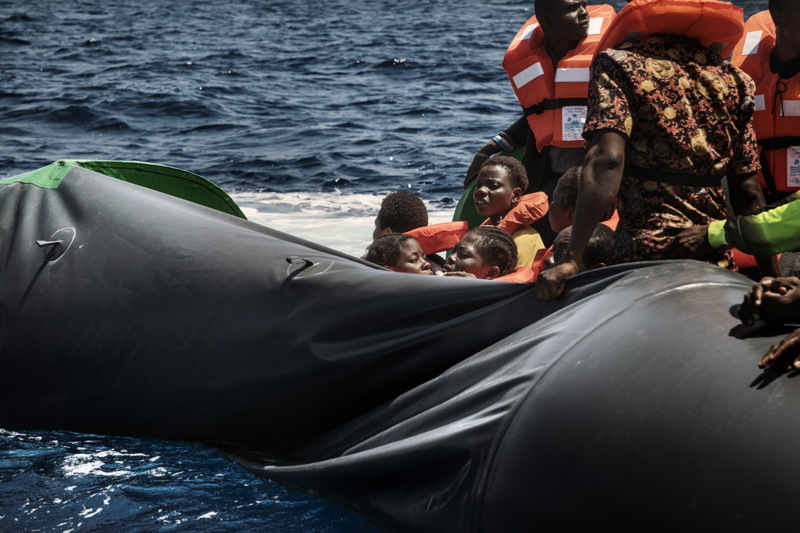 Perilous rescue operations of migrants aboard a ruptured dinghy. Mediterranean Sea,Italy. 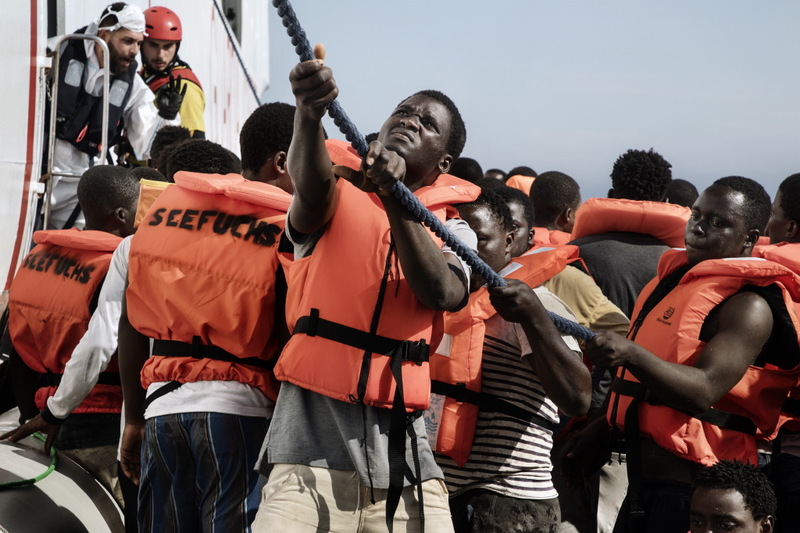 During the approach there are moments of panic caused by the concerned movements of the scared migrants. Mediterranean Sea, Italy. 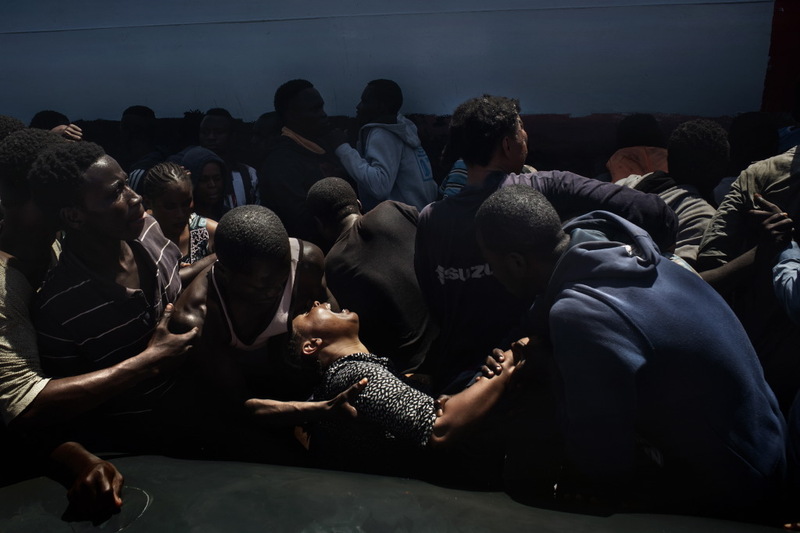 A migrant, exhausted by the odyssey, collapses on the side of the dinghy. Mediterranean Sea, Italy. 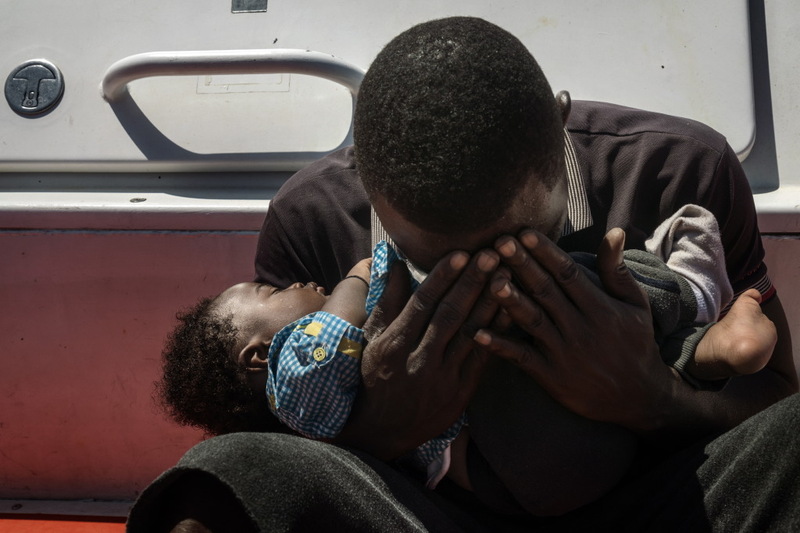 A man, holding his baby girl, prays, with his hands covering his face, just moments after being rescued. Mediterranean Sea, Italy. Rose, 19 years old, started her journey from Nigeria and was saved after an 8 hour journey in a dinghy. Mediterranean Sea, Italy. Isha Turay, 20 years old, left Sierra Leone. 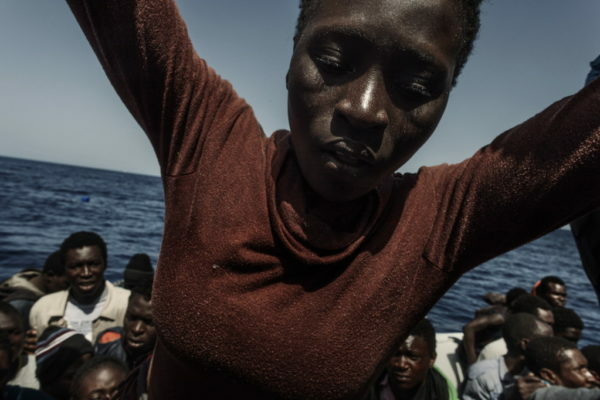 She is emotionally drained, as she just ends an odyssey in the sea which lasted about 10 hours, on a dinghy with other 160 people. Mediterranean Sea, Italy. 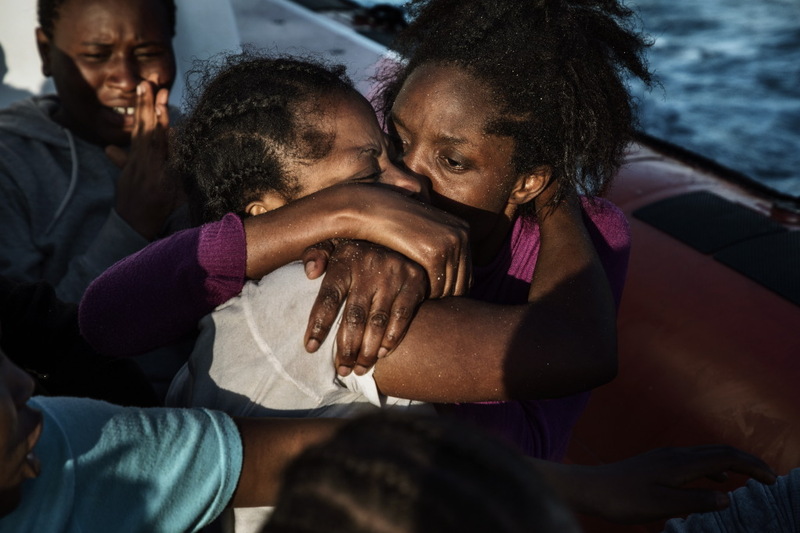 Anita, 25 years old, hugs her friend tight as they being rescued. Mediterranean Sea,Italy. 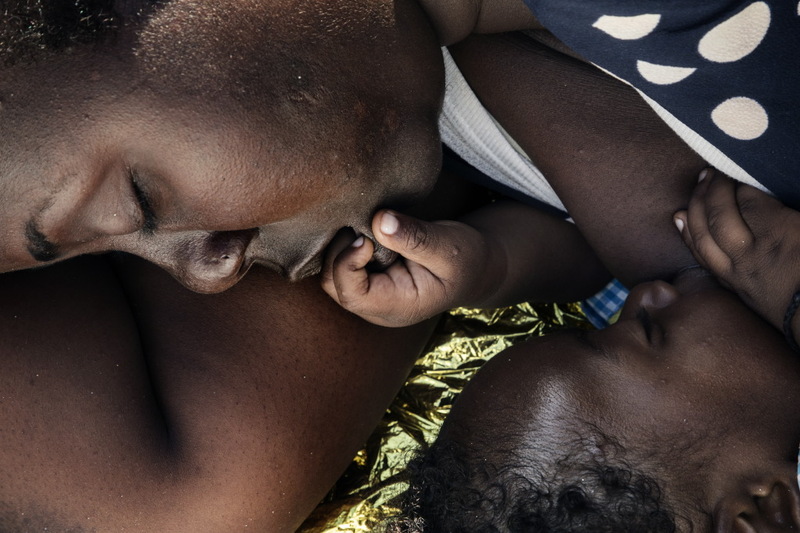 Gloria Isaac (Nigeria) sleeps on board the “Ubaldo Diciotti” ship, as she holds her baby girl. Mediterranean Sea, just kilometers away from Misurata (Lybia). 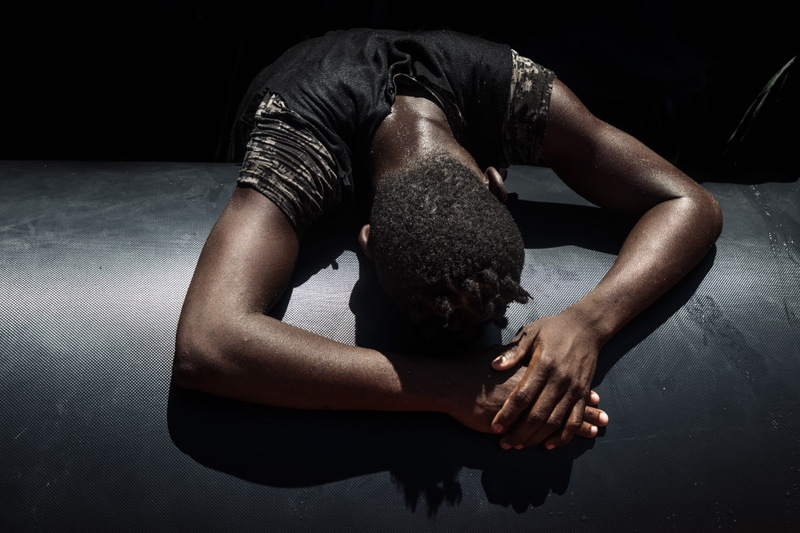 A woman stares as she sights one of the vessels from the Italian Coast Guard which is getting closer to the dinghy in which she is crammed in. Mediterranean Sea, Italy. 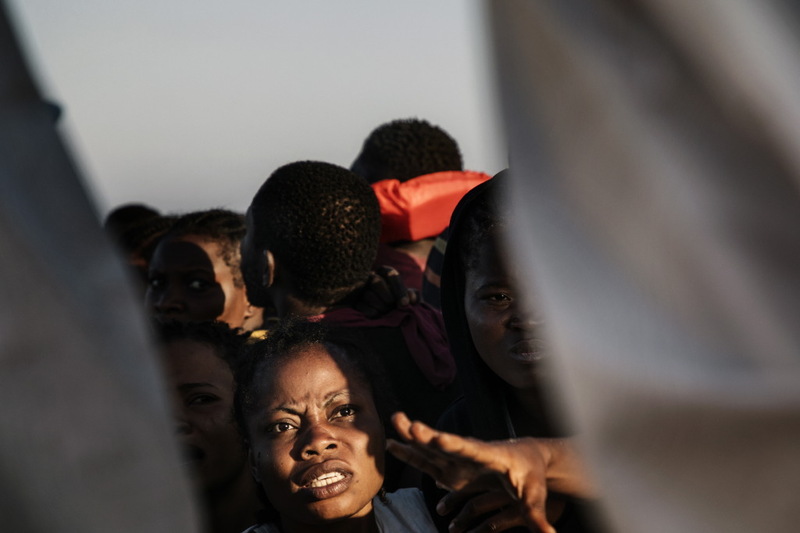 180 migrants with life-vests, aboard a dinghy, approach the “Ubaldo Diciotti” ship. As they pull onto the line, two Italian operators coordinate the operations. Mediterranean Sea, Italy. 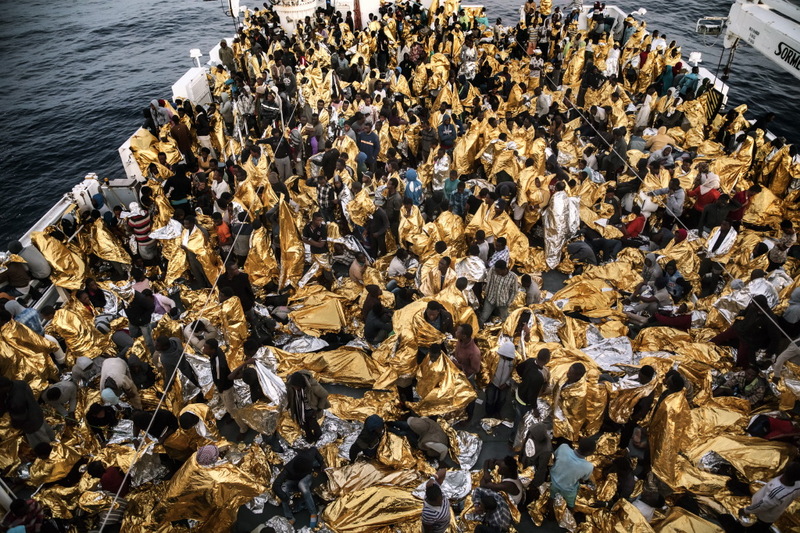 160 people travelled crushed onto one another aboard this dinghy. Mediterranean Sea, Italy. 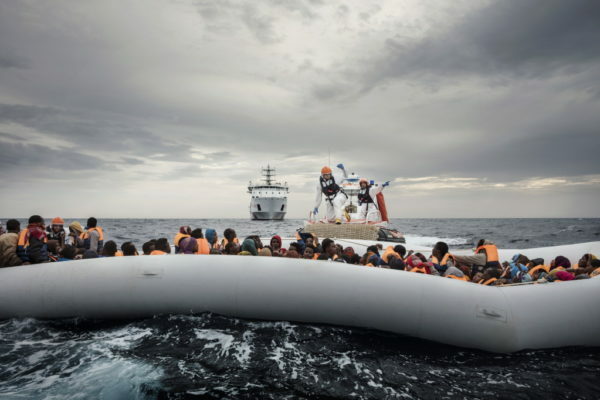 A member of the Italian Coast Guard crew aboard the dinghy now coordinates the approach phase. Mar Mediterraneo, Italia. 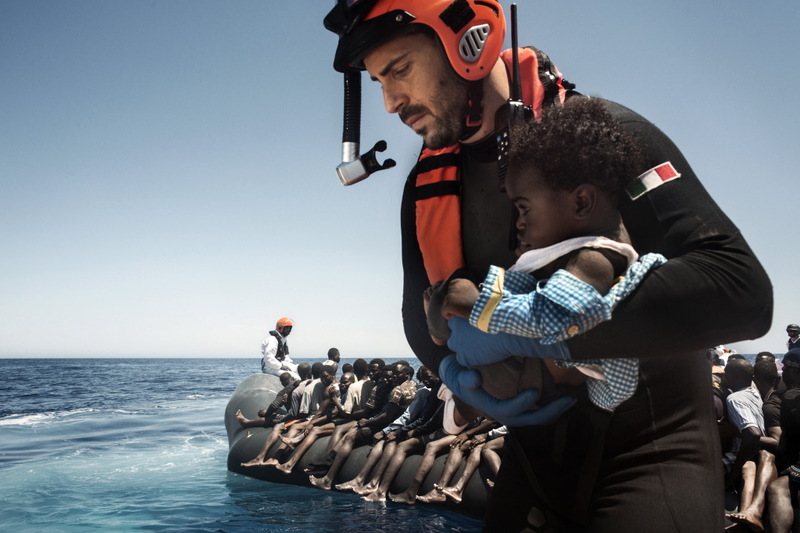 Una piccola imbarcazione di una ONG nella fase di soccorso. Mediterranean Sea,Italy. A small boat from an ONG during rescue. Mediterranean Sea, Italy. 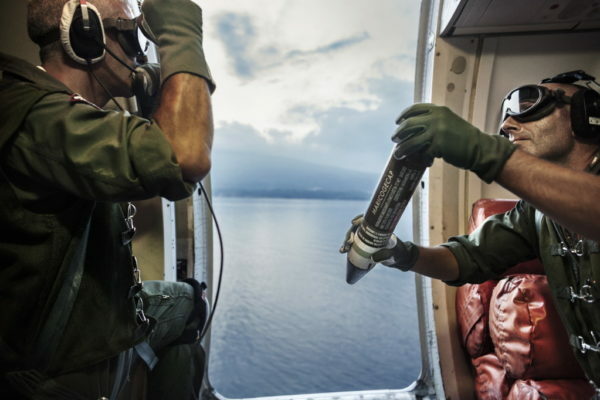 The rescuers from the Italian Coast Guard during a rescue operation. Mediterranean Sea, Italy. 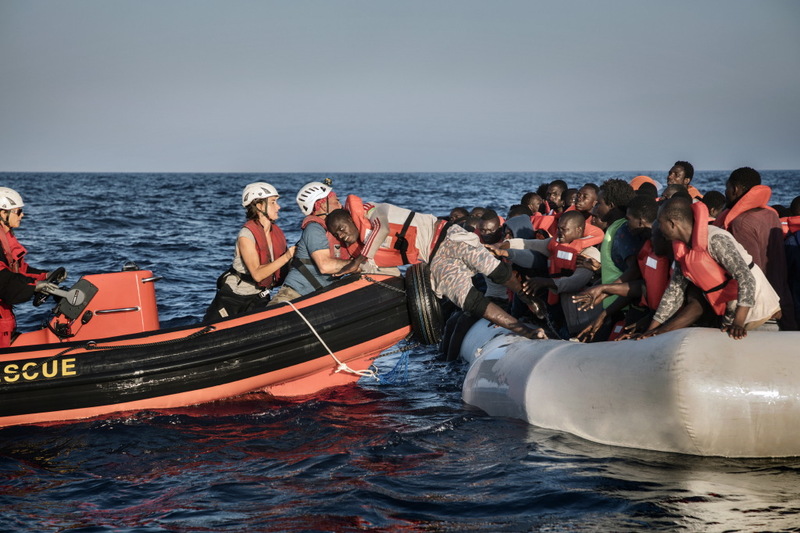 13 miles from the Lybian coast a rescuer from the Italian Coast Guard literally throws himself onto a boat that carries about 180 migrants to coordinate the rescue phases. Mediterranean Sea, Italy. 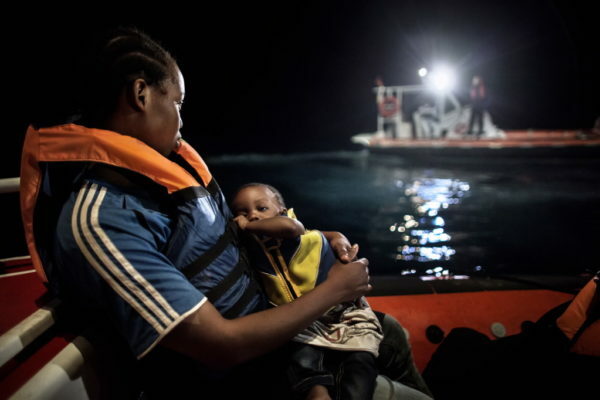 Rachel is a 8 month old Nigerian baby, who was saved during the rescue operations by the Italian Coast Guard. Mediterranean Sea, Italy. 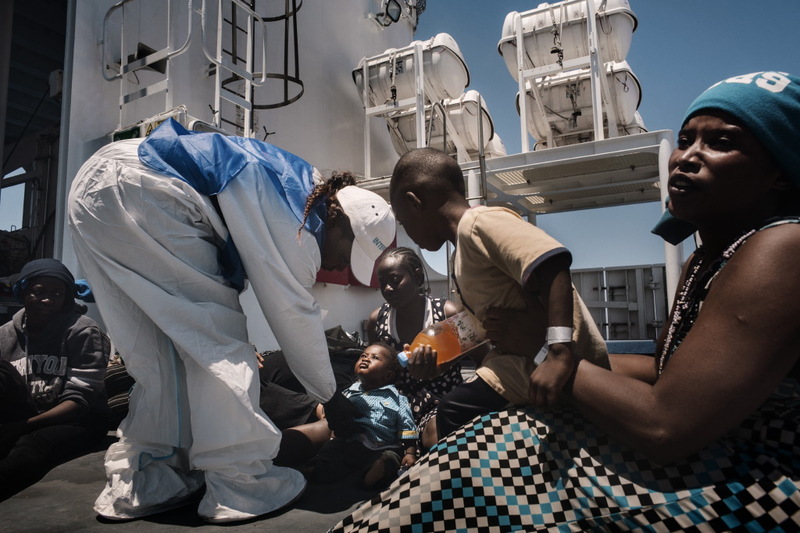 The migrants, starting from women and children , receive first medical attention, aboard the “Ubaldo Diciotti” ship from the Italian Coast Guard. Mediterranean Sea, Italy. 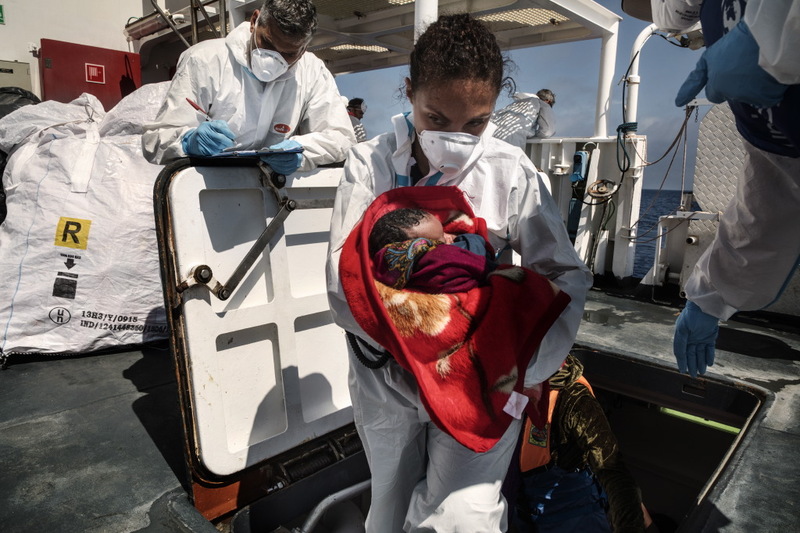 The “Rescue swimmer” from the Italian Coast Guard, a specific professional role created for this type of this operation, puts to safety a baby girl during the migrants rescue operations. Mediterranean Sea, Italy. 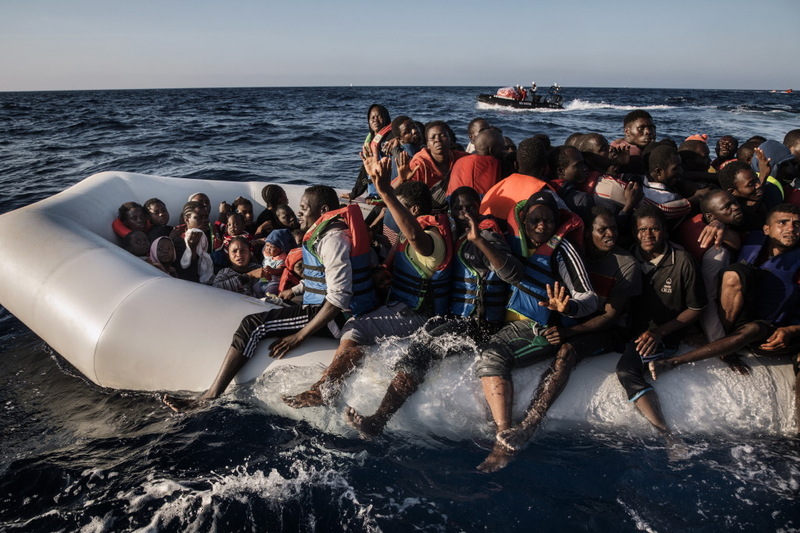 Aboard this dinghy, these migrants, all men , wait to be saved and taken on board the “Ubaldo Diciotti” ship from the Italian Coast Guard. Mediterranean Sea, Italy. 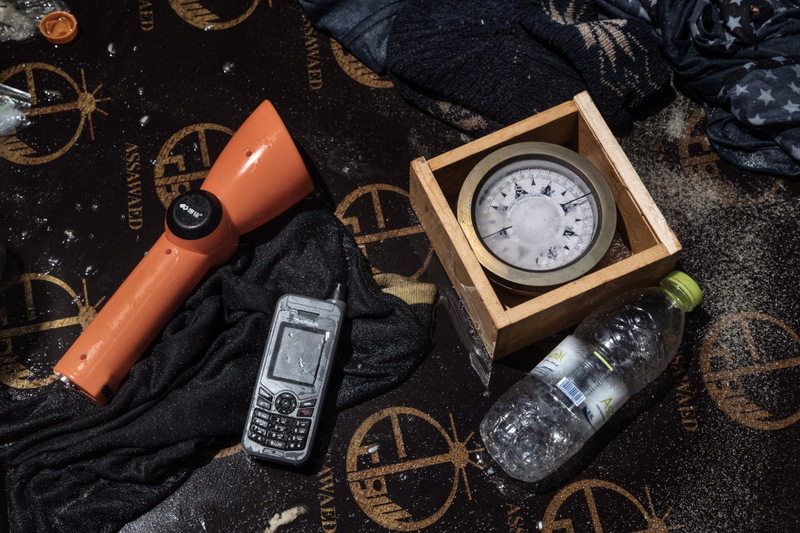 There is a rudimental compass, a bottle of drinkable water, a torch-light and an old satellite phone. Inside it, the number of the Central Operations Office of the Italian Coast Guard in Rome. Mediterranean Sea, Italy. 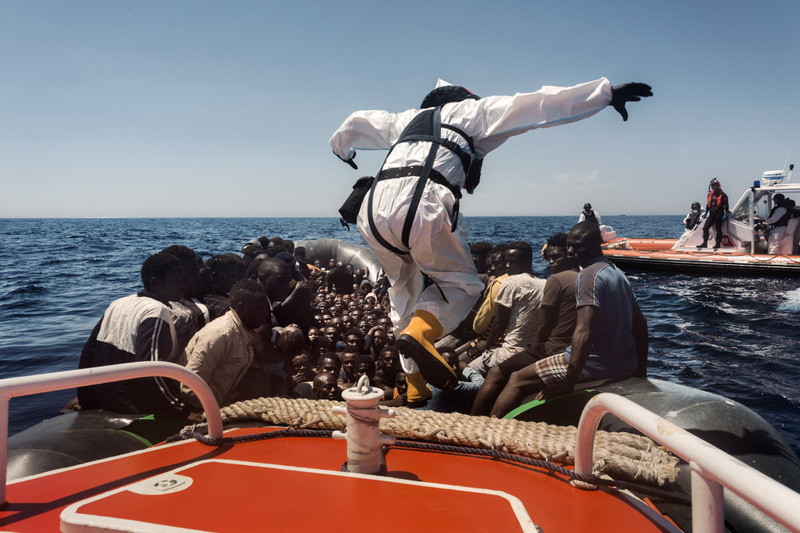 A small boat with three men on board is intercepted to be checked by the Italian Coast Guard. They could be the traffickers pretending to be fisherman. Mediterranean Sea, Italy. 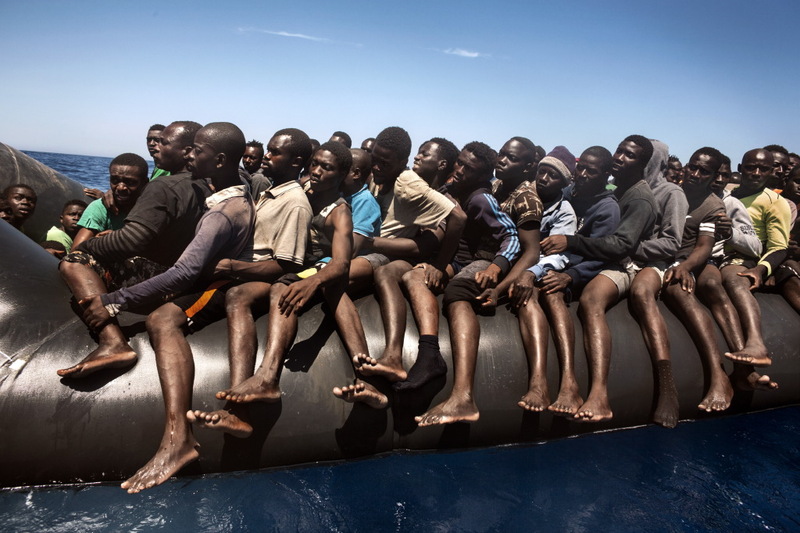 A group of migrants literally stacked inside the dinghy are waiting to be rescued from sea. Mediterranean Sea, Italy. The heat is unbearable, reaching almost 40 degree. 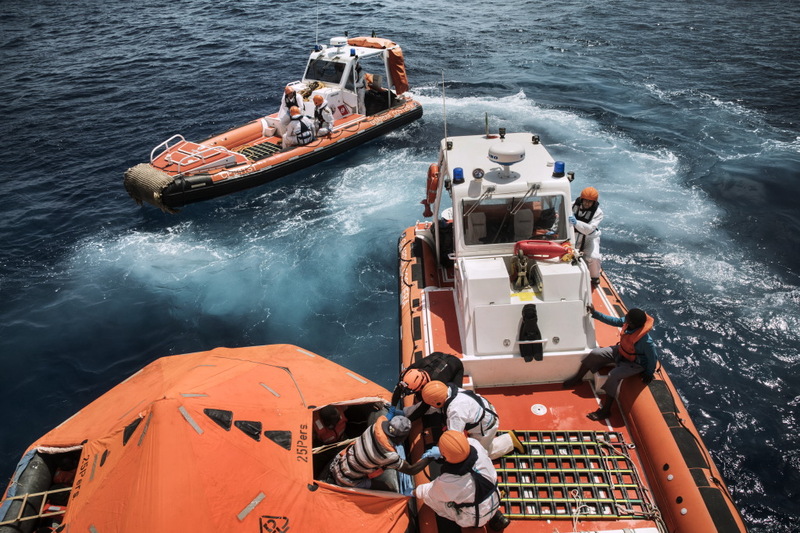 The crew and healthcare operators spray fresh water on the migrants still crunched together on the dinghy. Mediterranean Sea, Italy. 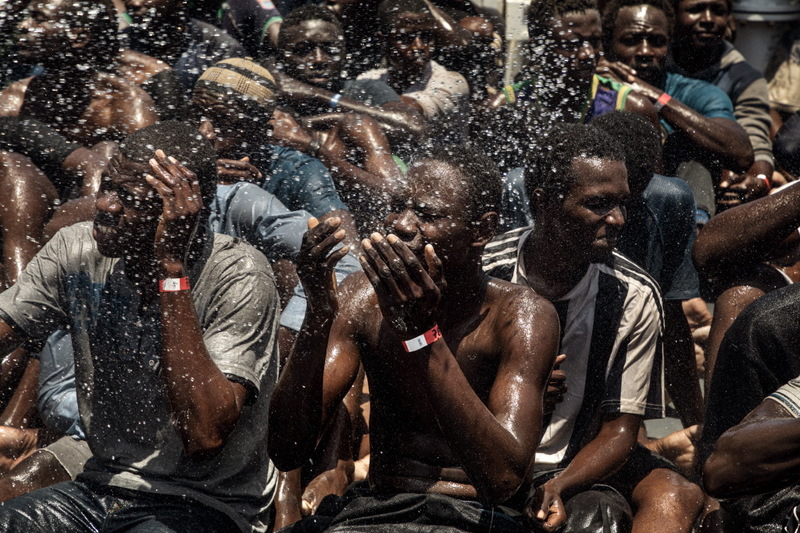 The flight deck of the “Ubaldo Diciotti” ship from the Italian Coast Guard carries 1.250 migrants all coming from Sub-Saharian Africa (Burkina Faso, Mali, Sierra Leone, Nigeria, Sudan, the Republic of Congo, Somalia and the Ivory Coast). Mediterranean Sea, Italy. 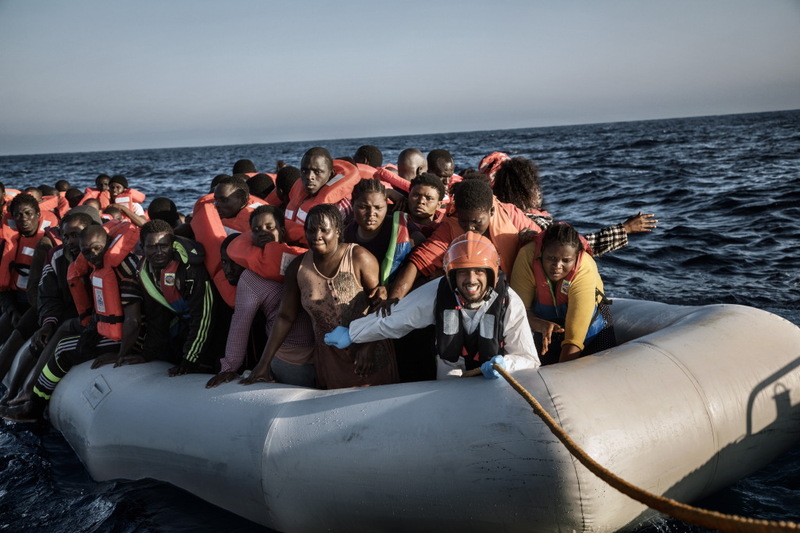 The migrants have abandoned the dinghy after being saved and have been transported aboard the “Ubaldo Diciotti” ship from the Italian Coast Guard. Mediterranean Sea, Italt. 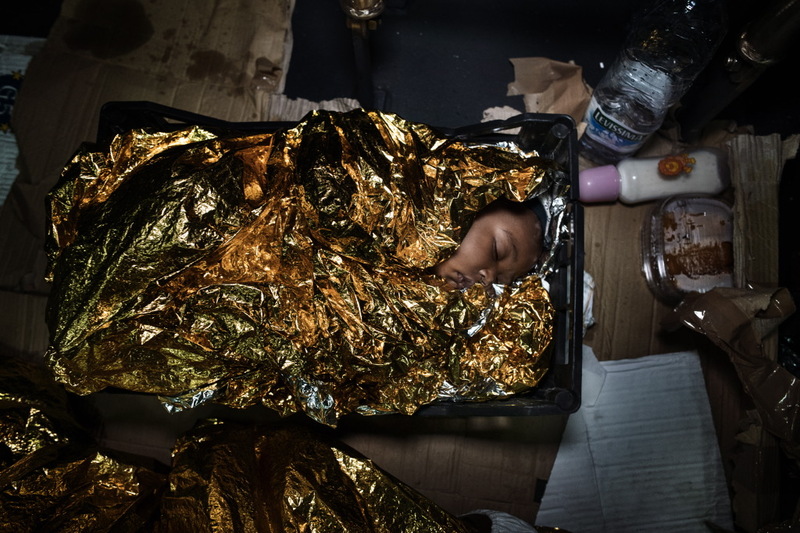 Mizani, 3 months old, sleeps inside a fruit crate aboard the “Ubaldo Diciotti” ship from the Italian Coast Guard, wrapped in a thermal blanket. Mediterranean Sea, Italy. 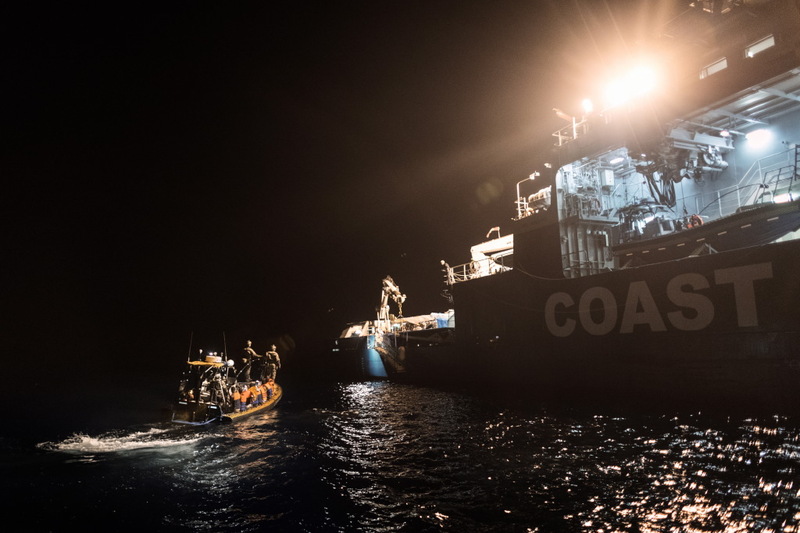 Rescue operation of migrants in a conjunct action of the Italian and Swedish Coast Guards.